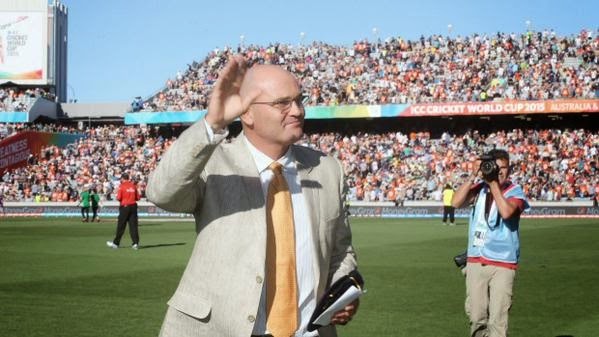 Welcome back and thank you for pointing me to Martin Crowe's fine words. Welcome back. I hope that you have been able to resurrect the enthusiasm for blogging, although I have to say that I do not know how you do it. You may have gathered from the tone of my kiwiblog posts today that I am becoming increasingly disillusioned with the vitriol that has come to pervade the site. We need a site like yours - where people can make and debate informed comment without abuse. Hopefully you will be on cloud nine late tonight and , when you come back to earth, will resume as per normal. Welcome back, and enjoy the cricket this evening. 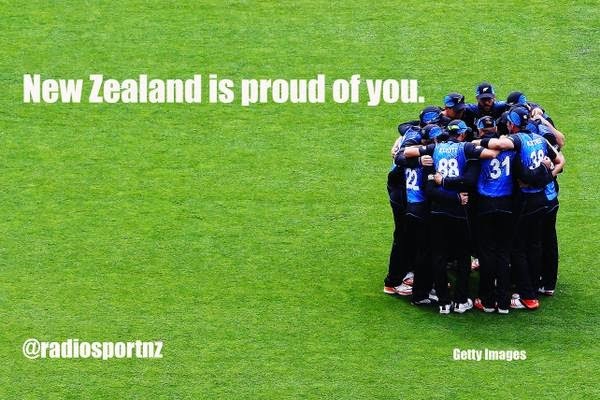 Whatever the result this current team has done New Zealand proud - with their attitude and their team spirit. Good stuff Inv - I go back to the 1958 tour of England in following the NZ Cricket Team. I do not like the Black Caps title - they are the New Zealand first eleven after all. I see two main keys for this match. 1. We must have a good start if we bat first as too often favoured NZ teams have been bowled out for low scores against the Aussies. 2. If Boult and Southee can swing the ball the Aussie top order is suspect. Runs on the board is what it is all about so we want to bat first and I think our bowlers are good enough to defend anything over 250. However, like you I have seen too many bad moments by NZ cricket teams to say we are favourites but by god we have a bloody good shot at winning tonight!! Welcome back, KS. I've been one of the many who has been hoping you'd come back. Go the NZ cricket team, the Warriors and the Phoenix!! Why not come back permanently ??? Please. And welcome back from me too. Once again a good looking New Zealand team are let down by their batsmen who leave it to the bowlers to salvage the situation. Batting only 45 overs is not acceptable! Boult, Southee and Vettori are good enough to apply pressure while Henry has always looked likely but the 5th bowler might find us out with such a low score. Well bowled and fielded Australia - you showed in the first half of the game what professionalism is all about - can we match it? I wish however the Australians would leave the sledging out pdm; they're a very good side, but their onfield behaviour is at times atrocious. Its all been said above, KS. While we understand where you are coming from, please reconsider. The blogospere is the poorer for your absence. One of the commentators observed that the Aussies sledged Elliott throughout the entirety of his innings. And worse still, seemed to find it some sort of badge of honour. Frankly, it's not. Not the game we were wanting, however we have nothing to be embarrassed about as we had a dream run up until now. Playing Australia on their home turf in the finals was always going to be hard, sledging or no sledging. I don't think this is entirely true because our boys were hardly in awe of the Aussie team and really rattled them earlier in the competition. Sledging or not - and I agree that it is unbecoming of a side that played as well as Australia did tonight we were outplayed in all areas of the game. The sad thing is that we have seen it all before. BTW Inv - I endorse all of the above remarks about the hole that your absence leaves in the blogsphere. @ pdm - let's not forget that as rugby is our national sport here, cricket is Australia's national game. Personally, I cannot wait until we play home and away tests against them next season. KS, great to read your blog and as many have said, we would love to do it on a more regular basis. No doubt you have much to do down there in Wangavegas but we really enjoy your posts. Hi KS, good to see you here again. The World Cup was a huge emotional high – exciting performances, and a fine bunch of blokes that we are happy for our kids to look up to. I've always been an admirer of McCullum and wanted him to be captain back when he and Taylor were both up for it. Regardless of Taylor's talents as a batsman, he never seemed like a "leader of men", a quality which McCullum exudes effortlessly. McCullum's positive and aggressive style has paid off in spades over the last 18 months, in terms of his leadership and batsmanship, and that's been evident through almost all of the tournament up until the final. So what went wrong at the final? (I couldn't bear to watch the final at all, but that was my own nervousness and pessimism.) I've heard McCullum criticised for both being too tentative and too aggressive in that first fatal over. But if he had tried to cautiously block his way through six Mitchell Starc balls, he could still have been undone by superb bowling. You live by the sword, you die by the sword. I watched McCullum take England to the cleaners at the Wellington stadium. It was exhilarating and crazy. I suspect that you have to understand that you can't have it both ways. You get the crazy exhilaration of McCullum when all goes to plan, but sometimes it doesn't work. Sport is a mystery – an unpredictable combination of luck and talent. Australia played better on the day. They only team who beat them was us (just!). The only team who beat us was them. We came second in the tournament, with reputation and world standings much enhanced. Despite the huge emotional comedown of a big defeat in the final, it was all worth it. I've seen McCullum grow as a leader through this tournament and his final press conference was a masterclass in good-humoured and generous leadership. I hope he puts off retirement as long as possible. I've also learnt, through this tournament, never to read anything written by Mark Reason in the DominionPost, who seems to have an irrational loathing of McCullum, and whose smearing of him borders on the defamatory. Life is too short to raise my blood pressure this way, so when I see his name now I turn the page. A fine bunch of guys, brilliantly lead – can't wait for the series against England and Australia. KS, it is good to see you blog again, if only for a day, your site has been missed. I have moved on from NZ, and am currently enjoying life in Beijing, so did not watch the cricket, but I spent the day listening to the game on the radio, while it did not go the way we would have liked, as a kiwi far from home it was great to hear the international commentators heap a load of praise on the Black Caps for the way they have played, and conducted themselves, through the tournament. 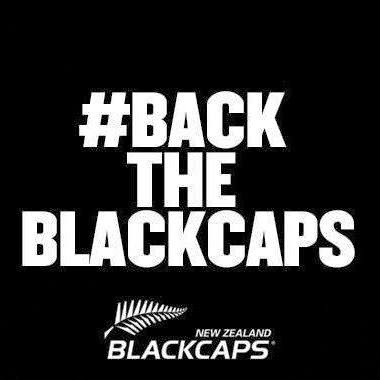 I am very proud to be a kiwi, and the attitude of the Black Caps has made me even prouder. And slightly off topic, I hope that in the future you regain a passion for blogging and we see you return to the blogosphere. Excellent comment Kassto. McCullum has risen mightily in my esteem in the last year or so. I've seen quite a bit of test cricket in that time, and have seen at least a part of each of his big innings in New Zealand in the last two seasons. If giving up ODI's is the cost to have him continue as test captain, it is a price worth paying. And with the tour of England not far away, it will be interesting to see whether Martin Guptill, he of the much-improved technique, is given the opportunity to partner Tom Latham at the top of the innings. It seems to be our only weak point at the moment. Failing that, Dean Brownlie has certainly advanced his case. @ Robert Guyton - you never learn, do you? You seem intent on butting in where you are unwelcome. Please be assured you are still unwelcome here and desist from making your usual inane, sneering comments. Is your middle name "Haddin"? Back up on the horse KS? I hope you liked it and stay right on up there! Judging by the comments above you are much wanted - and even needed there. Go on, stick around, you know you (and we) want you to.